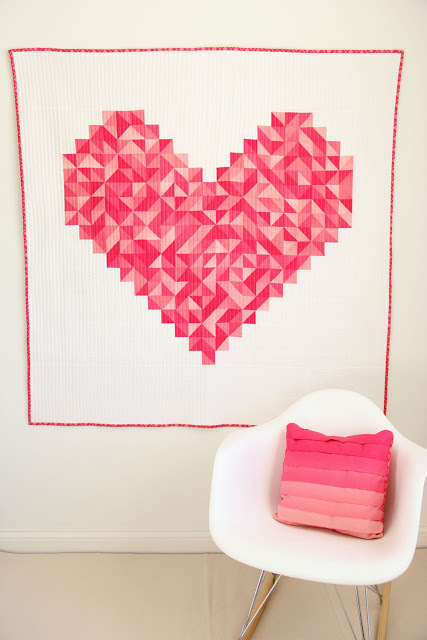 In January, one of my favorite designers, Vanessa Christenson of V & Co., debuted her first quilt of the year … “I Heart You.” I’d been tossing around a few ideas for my Valentine mantel, and I’d been thinking it would be cool to do something quilty. When I saw this pattern, I just knew that my thoughts were travelling in the right direction. I just love it when a plan comes together! the perfect Valentine-y fabric collection … “Kissing Booth” by Basic Grey for Moda. This pattern features a whole bunch of half-square triangles. I had so much fun playing with them! I love how it turned out. It was exactly what I envisioned. Lots of reds, pinks, creams, with hints of grey and brown thrown in for character, dropped against a stark white background. Quilted perfection! Pattern: “I Heart You” from V & Co. available HERE. Coming up next … my Valentine themed mantle! Did you use only one Jelly Roll? Want to purchase enough fabric. Thanks!! Hi Lani, I am featuring you at Share Your Cup later today. Your quilt turned out so beautiful, you’re so creative! Thanks so much for sharing at Simple & Sweet Fridays. Thank you so much! I’ll definitely come by and Saturday and join the party. Thanks for the special invite! 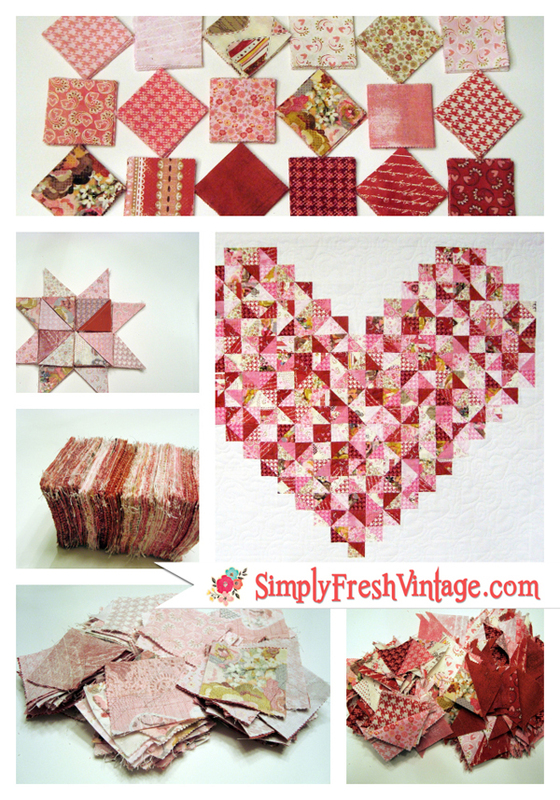 What a great Valentines quilt, I really like the fabrics you used. Thanks for sharing! Thank you so much for your kind words! I’ll definitely come by and link up to your party on Tuesday. Thanks for the invite! Thank you so much for your kind words! I’ll definitely come by on Tuesday for your party! Wow what a beautiful quilt! Love the colors, and how it just seems to sparkle! I could not see where to follow you. All of our social connections are at the top of the page on the right. I’m still a new blogger, so please bear with me while I try and figure out how to add other ways for readers to follow us. This is gorgeous! Love, love the moda fabric. It just pops next to the white. So happy to have you share this with Share Your Cup. Thank you so much Jann 🙂 I enjoyed seeing so many others at the Share Your Cup Party! Oh man…I absolutely love the Kissing Booth Fabric! I’ve seen it several times now and love it the more I see it. The heart is fantastic! Thanks for sharing!. I love just about anything from BasicGrey. This was a fun collection to work with. I’m glad I have plenty leftover for another project. Hi!!!! Your quilt is wonderful!!!! Thank You for sharing!!!! I love it!!! Thank you Judy! I love the way the different colors and patterns give it so much texture. simply beautiful ….you are very unique in many ways..glad to come across you.. Please edit your post and give a shout out to the linky party so your friends can come and take part. Thanks so much. Thank you so much Thearica! I’ll pop back in later to visit some of the other linkers. Oh, I love this. Great quilt. I love that! 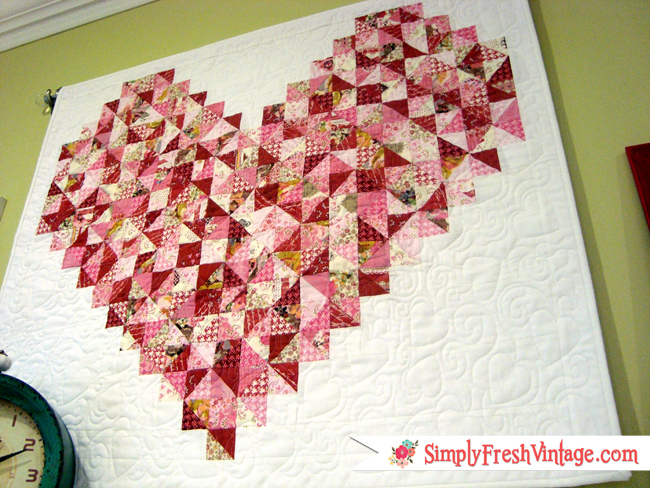 I think my favorite part is the white with the quilted hearts pattern in it! I LOVE white with red so that really makes me happy. 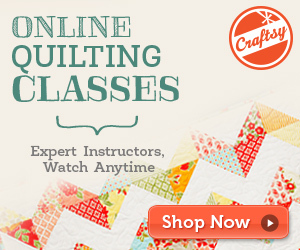 And, sigh, it makes me wish I had a quilting machine! Thank you so much! 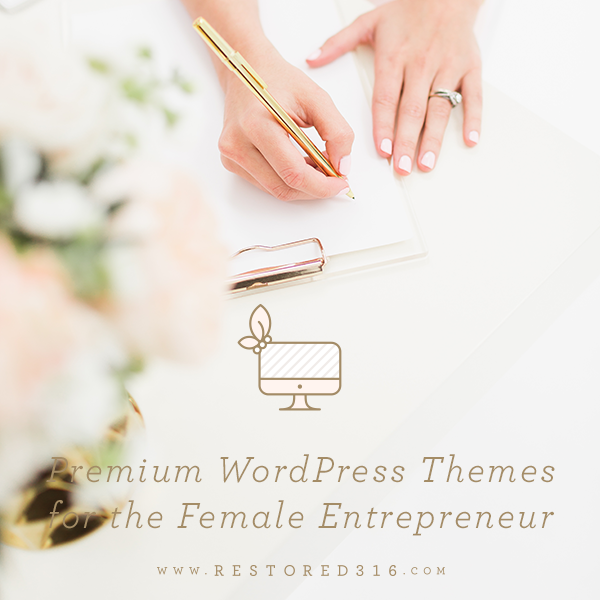 It’s just been in the last year that I’ve been adding a lot of solid white and cream to my projects. I love the way it makes the colors and patterns pop. This is absolutely beautiful! That fabric is just perfect. Thank you for your kind words Deb! I love your heart pillow too! I’m so impressed! I’m still learning to use my sewing machine and the amount of work involved in that quilt is just mindboggling to me right now! It’s gorgeous! It really wasn’t that difficult to do. The prep work getting all the half square triangles assembled was more involved than the actual piecing of the top. Good luck on your sewing adventures! Wow, that is just gorgeous! Such a lot of work… and a beautiful result 🙂 Thank you for the inspiration! Thank you so much Leisa! I appreciate your kind words. It is so great! I love the fabric line. Were you able to use a jelly roll for the half squares? I did use the jelly roll and trimmed the half square triangles to 2 inches. How absolutely gorgeous! I am in awe…..! This is a true piece of art. And how gorgeous it looks against that green wall. Oh my! Thank you so much Crystelle 🙂 I had a lot of fun making it and am truly enjoying it! 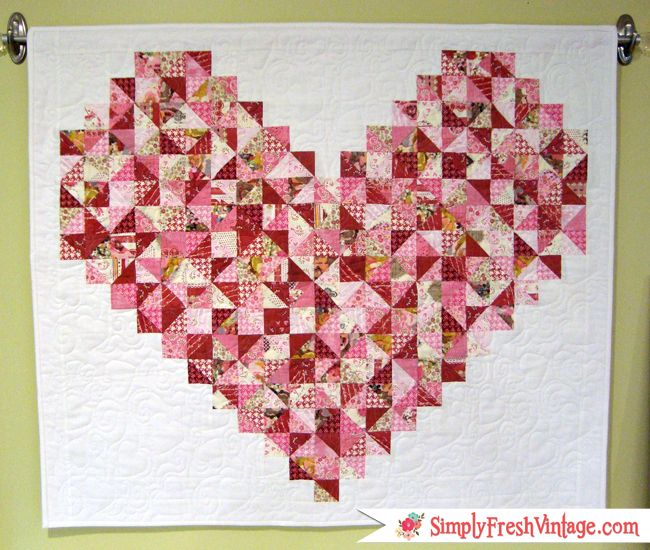 I “heart” your quilt. Your version has so much more character than the inspiration photo.